Hello our loyal readers, we have been publishing lots of articles on the series such as Top 10, Top 5 and Top 3 and have covered lots of topics from students to stock broker/trader, but I have never written about the bloggers. The Blogger are the most active people on the Internet and there are lots of application from many developers, some are awesome where as some are fake. Bloggers are the most experimenting people , they install all the apps and try them but my dear friend here are the Top 10 applications which each and every blogger must have in the android smart phone. I have lots of blogger friends, who have their blog and work day and night to earn a lot from it. Many of them are just teenagers and they earn in 4 digit dollars. This people are strongly dedicated towards their blog and update and promote it whole the time in various ways. Many bloggers update and maintain their blog just from the smartphone and rarely touches their personal computer. 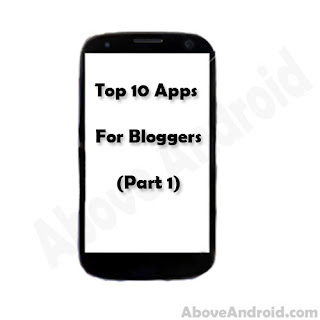 We are displaying the Top 10 apps for bloggers to be on the top in two parts, here is the part one. WordPress for Android puts the power of publishing in your hands, making it easy to create and consume content. Write, edit, and publish posts to your site, check stats, and get inspired with great posts in the Reader. What’s more? It’s open source. WordPress for Android supports WordPress.com and self-hosted WordPress.org sites running WordPress 3.2 or higher.2. The only way to know whether you are doing the right job is to check the numbers, and the numbers don’t lie. gAnalytics is a great little app that simply plugs into your Google Analytics account and presents the numbers in a format that is easy to read and understand. gAnalytics is by far one of the best Android Google analytics apps. With the main options as Panel, Visitors, Content, Goals and Ecommerce, you will feel so comfortable using it on an Android device. You can set the time period and find out the number of visitors, page views, bounce rate, new visits, all this data with the corresponding charts. Also you can compare your report and see it on the charts too. It supports multiple profiles and multiple accounts. This is awesome app which tells various factor that affects the SEO and also list the ranking of various website ranking site such as Google Pagerank, Alexa Rank, Compete Rank, Pages indexed in Google, Pages indexed in Bing, Pages indexed in Yahoo, Backlinks according to Google, Backlinks according to Bing, Backlinks according to Yahoo, Backlinks according to Alexa, Facebook likes or shares count, Tweets count and Google Plus count. This is just a part one of the article, soon the second part is coming in few hours just be active and keep visiting mean time visit other articles from Above Android. Thank You.